The relationship among the federal government, the states, and parents with regard to education is increasingly dysfunctional. Parental control over their children's education has gained impressive momentum in recent years at the state level. Meanwhile, states have been increasingly willing to relinquish sovereignty over education in exchange for more federal dollars. Failure would help bring clarity to these issues by examining whether students and the country better off after 30 years with the Department of Education and suggesting alternatives to an ever-expanding federal education bureaucracy. Part I would begin by examining the development of the current Department of Education, including the legislation that gave rise to it, and the pressure groups that have shaped it. Additional chapters would examine related issues including the arguments for and against the creation of a national education department, its origin, current structure, spending, and growth over time. Part II would examine the results to date against the education department's own standards. These include overall student achievement nationally before and after the advent of the Department of Education as well as international comparisons of U.S. student achievement. Outcomes of some of the largest Department of Education programs would also be considered in this section, along with some of the lesser-known department programs and initiatives. Part III would examine truly federal alternatives to the current tug-of-war between the national and state governments in light of the growing parental-choice movement. Included in this section would be chapters examining a strict-constitutionalist model, which denies any federal authority in education. Another alternative model examined would be the National Bureau of Education model, inspired by the original 1867 precursor to the current Department of Education, whose primary mission was to serve as a repository of information so schools nationwide could emulate best practices. In addition, this section would seek to include cross-country comparisons of education systems of top-performing Organization of Economic Cooperation and Development (OECD) countries. 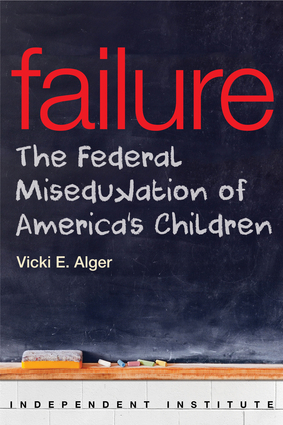 Vicki E. (Murray) Alger is a Research Fellow at the Independent Institute and Senior Fellow and Director of the Women for School Choice Project at the Independent Women's Forum. She has been Associate Director of Education Studies at the Pacific Research Institute for Public Policy in Sacramento, California, and the Director of the Goldwater Institute's Center for Educational Opportunity in Phoenix, Arizona. She received her Ph.D. in political philosophy from the Institute of Philosophic Studies at the University of Dallas, where she was an Earhart Foundation Fellow, and she has lectured at universities nationwide, including the U.S. Military Academy, West Point. She is the author of more than 30 education policy studies, co-author of Short-Circuited: The Challenges Facing the Online Learning Revolution in California and Not as Good as You Think: Why the Middle Class Needs School Choice, as well as Associate Producer of the documentary "Not as Good as You Think: Myth of the Middle Class School."